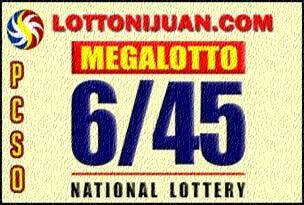 Check out the 6/45 Megalotto Results here that were drawn today (Wednesday). The draw was held at the Philippine Charity Sweepstakes Office. Tickets should have all the winning numbers in any order to win the jackpot prize. You can also see here the other Philippine PCSO lotto draw results for today. Check out the 6/45 Mega Lotto January 2018 Results Archive. The 6/45 Megalotto Draws can be seen every Monday, Wednesday and Friday at 9:00 p.m. over PTV 4 together with your other favorite Lotto games. Find out also the current jackpot prize, past 6/45 Mega Lotto results and our exclusive probable tip for the next draw. View also the current draw schedules and highlights of the latest Philippine Lotto draw.